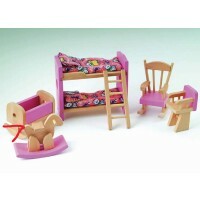 There are many rooms in our dolls' houses and so we have selected a lovely range of wooden dolls' house furniture to put the finishing touches to these wonderful wooden toys. If your house needs a bathroom suite, we've got one! Kitchen? No problem. 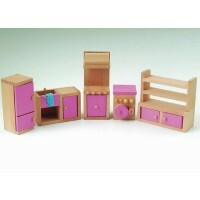 How about a bedroom set? Of course. We also have furniture for the garden, including swings and slides and vegetable beds! 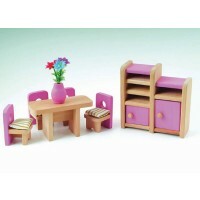 We also have accessory sets which add even more realistic details, such as table lamps, coffee tables, telephones and book cases. We think it's only fair to allow children's imaginations to wander as far as they wish, and this collection will encourage many hours of imaginative play.